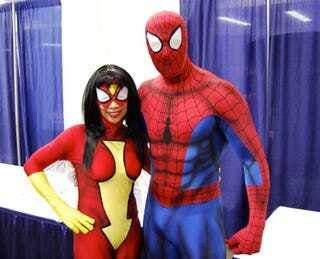 How Would Spider-Man And Spider-Woman Get Naked? Annalee is asking costumed fans roaming the halls of WonderCon one crucial question: How they would strip off their costumes if they had to get naked really, really fast? She found not but two of the most famous arachnid-based characters in the comic book world and asked them how they'd strip down in record time. Turns out that Spidey didn't just inherit radioactive powers, he also gained the ability of extreme sewing and the power to airbrush muscles onto his suit. Annalee: "If you guys had to get out of those costumes really, really fast, how would you do it?" Spidey: "You mean like, if the building was on fire? I always build secret escape hatches in here, so you can just pull and they're gone." Spidey: "I mean, when you gotta to to the bathroom, you gotta go."